After ten years, the pesky 9/11 Truth movement has refined its arguments but still hasn’t proved the attacks were an inside job. Their key claims are refuted on multiple grounds. The conspiracy theories started flying just days after the September 11, 2001, terrorist attacks on New York and Washington, DC. Over the decade since, several technically elaborate claims have been refined by the “9/11 Truth” movement. Do these intricate arguments—including the rapid collapses of the towers, alleged evidence of thermite usage at Ground Zero, and the collapse of World Trade Center (WTC) 7 (a forty-seven-story building damaged by the fall of WTC 1) “into its own footprint at freefall acceleration”—disprove the mainstream consensus that the September 11, 2001, attacks were the work of al-Qaeda terrorists using hijacked airplanes? In a word: No. Dylan Avery and Jason Bermas, the creators of the low-budget documentary film Loose Change, did much to give the 9/11 Truth movement significant momentum in 2005 and in following years. The film, which has undergone several revisions, has been shown on many television stations but is primarily an Internet and DVD phenomenon. Its basic claims are that Flight 77 could not have accounted for the damage at the Pentagon, that the Twin Tower fires were insufficient to cause their collapse, and that cell phone calls from the hijacked airplanes would have been impossible at the time (Avery 2009). David Ray Griffin is a theologian whose voluminous writings on 9/11 are frequently cited by other 9/11 theorists. NASA scientist Ryan Mackey has written a very thorough critique of Griffin’s claims (Mackey 2008). Once known as Fleischmann and Pons’s competitor for “cold fusion” research in Utah, Steven Jones has written several 9/11 Truth articles. His work with others (including chemist Niels Harrit of Denmark) on detecting nanothermite in WTC dust is frequently cited as “peer-reviewed research” that proves “inside job” claims. Physics teacher David Chandler has produced several papers and Internet videos contending that high school physics easily shows that the tower collapses could not have happened from gravity alone. He claims this proves that explosives must have been used. In the past few years, architect Richard Gage’s group, Architects and Engineers for 9/11 Truth (AE911 Truth), has provided “Truthers” with the ability to claim that thousands of engineering and architecture professionals demand a new investigation into the cause of the attacks. Gage travels the world giving presentations, and his group puts on news conferences and mock debates several times a year (but most often around September 11, the anniversary of the attack) (Thomas 2009; Thomas 2010c). Hollywood stars who have publicly supported 9/11 Truth claims include Rosie O’Donnell, Charlie Sheen, and Ed Asner. Sheen often talks 9/11 with radio host Alex Jones (www.infowars.com). These celebrities frequently cite (and sometimes mangle) claims made by Truther proponents like Griffin and Gage. Former wrestler and Minnesota governor Jesse Ventura has done two 9/11 conspiracy shows on his TruTV series Conspiracy Theory (see “Dave Thomas vs. Jesse Ventura: The Skeptical Smackdown”). As with any well-developed pseudoscience, literally thousands of individual arguments can be advanced in support of the proposition that the United States secretly carried out the September 11 attacks. This report will examine the most enduring and oft cited of these claims: “free fall” of the towers, reports of thermite and molten steel, and WTC 7’s curious collapse. Some of the factions that have developed (such as the “no-planers”) will also be described briefly. Perhaps the most bizarre aspect of September 11 was the rapid destruction of both 110-story Twin Towers: after the collapses began due to cascading structural failures at the airplane impact locations, each tower fell completely in just fifteen to twenty seconds. Mainstream scientific analyses, including years of work by the National Institute of Standards and Technology (NIST), generally looked at the cause of each collapse: the intense fires (started by jet fuel and fed by office contents and high winds) eventually caused floor trusses to sag, pulling the perimeter walls inward until they finally snapped. At this instant, the entire upper section of each tower fell the height of one floor, initiating an inevitable, progressive, and utterly catastrophic collapse of each of the structures. While the mainstream explanation (dismissed as the “official story” by 9/11 Truthers) usually ends with the initiation of these unstoppable collapses, the 9/11 Truth movement’s attacks begin there. Gage of AE911 Truth says on that group’s website, “Destruction [of the Twin Towers] proceeds through the path of greatest resistance at nearly free-fall acceleration” (Gage 2011; emphasis added). Many 9/11 Truther pundits drop the “nearly” and say simply that the collapses were at free fall. Truthers then insist that free fall acceleration indicates a complete lack of resistance, proving that the structures were demolished with explosives. We are also told that the sheer mass of the towers, “80,000 tons of structural steel,” would simply resist collapse. The Twin Towers used a “tube within a tube” architectural design, which provided considerable open office space in the interiors of the Towers. Much of the structural support was provided by a dense grouping of thick central core columns in the interior and the perimeter walls on the outside. When the towers began to collapse, large parts of the inner cores (called “the Spires” in 9/11 Truth circles) were actually left standing, briefly, before they, too, toppled over. The perimeter walls were largely forced to peel outward in large sections, producing the iconic images of Ground Zero with which we’re all familiar. Between the outer perimeter and the inner core, the weight of the upper sections plowed through one floor after another, breaking the floor connection brackets and support columns, pulverizing concrete decks, and gaining momentum and mass with each additional floor failure. Had the buildings been constructed differently (the Port Authority was allowed to circumvent some existing New York buildings requirements for the Towers), the collapses might not have even happened (Young 2007). Even the 9/11 Truth movement’s most eminent physicists are confused about the basic principle of the difference between static and dynamic forces. A piece of paper, taped across a jar’s opening, will support a heavy coin such as a quarter indefinitely (static load). However, if the coin is dropped from just a few inches up, it will tear right through the paper (dynamic load). Given the information at hand—for example, the mass of the upper section of the north tower (fifty-eight million kilograms), the distance it fell (3.8 meters, about twelve feet), and the stiffness/rigidity of the lower structure itself, the dynamic force imparted on the lower section can be estimated as some thirty times the upper portion’s weight. This is many times the lower structure’s safety margin, which explains why it was quickly overwhelmed. Once progressive collapse began, there were decreasing time intervals of free fall (between floors), punctuated by very brief, incredibly violent collisions—decelerations—of the upper mass, for each floor in turn. There was resistance at every step of the collapse, as the upper section collided with and incorporated each floor below. Conservation of momentum shows that the reductions in falling speed were slight as each floor was impacted, going as the ratio of floors before to floors after (e.g. 14/15, or about 94 percent, for the first impact). Accordingly, the upper section fell from rest to about 19 mph, was slowed down to 18 mph by the first impact, continued to fall until a speed of 26 mph was reached, was then slowed down to 24 mph by another impact, and so on. While the first plunge lasted about nine-tenths of a second, the upper section took only four-tenths of a second to fall through the next floor, three-tenths of a second for the next one, and so on until the bottom floors, which were crushed at a rate of just seven-hundredths of a second each, at speeds of over 100 mph. Yes, there was resistance at every step, as many tons of structural steel was demolished; yet the entire process, like an avalanche, lasted only fifteen to twenty seconds, about 50 to 100 percent longer than true “free fall” would have lasted. The thermite reaction is very hot, but it is also very slow compared to high explosives. 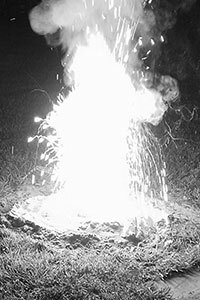 The thermite reaction, which takes place between iron oxide (rust) and powdered aluminum, is practical for welding train tracks in the field and for destroying engines of vehicles that must be left behind during combat operations. The self-sustaining reaction, once initiated with heat, produces significant volumes of molten iron, which can melt and cut iron structures beneath it. For thermite to melt through a normally vertical steel beam, however, special high-temperature containment must be added to prevent the molten iron from simply dropping straight down uselessly. The thermite reaction is very hot, but it is also very slow compared to high explosives. Thermite is simply not practical for carrying out a controlled demolition, and there is no documentation of it ever having been used for that purpose. Jesse Ventura hired New Mexico Tech to show how nanothermite can slice through a large steel beam. The experiment was a total failure—even in the optimum (horizontal) configuration, the layer of nanothermite produced lots of flame and smoke but no actual damage to the massive I-beam tested. However, Ventura’s TruTV Conspiracy Theory show slyly passed it off as a rousing success (Thomas 2010a). Niels Harrit and Steven Jones, along with several coauthors, published the “peer-reviewed” paper “Active Thermitic Material Discovered in Dust from the 9/11 World Trade Center Catastrophe” in the Bentham Open Chemical Physics Journal (Harrit 2009). This article does not make the case for thermite use on 9/11. The paper examined “distinctive red/gray chips” found in WTC dust (unfortunately, with no chain of custody for the dust), and these were claimed to be thermitic because of their composition (iron oxides and pure aluminum) and other chemical properties. However, the presence of rust and aluminum does not prove the use of thermite, because iron oxide and aluminum are found in many common items that existed in the towers. Furthermore, the authors admit that their “differential scanning calorimeter” measurements of the supposed thermitic material showed results at about 450 degrees C below the temperature at which normal thermite reacts (Fana 2006). Finally, the scan of the red side of the “thermitic material” of Harrit/Jones is a dead-on match to material Jones himself identified as “WTC Steel Primer Paint” in his Hard Evidence Down Under Tour in November of 2009 (“Sunstealer” 2011). Harrit’s article describes the red portion of the chips as “unreacted thermitic material.” But while thermite may be slow, it does not stop its reaction once it has begun. Because thermite supplies its own oxygen (via iron oxides), it can even burn underwater. Suggesting that the samples show partially reacted thermite is preposterous. Claiming that thermite would explain molten pools of steel weeks and months after the attack is equally preposterous. The article’s publication process was so politicized and bizarre that the editor-in-chief of the Bentham journal that featured Jones’s article, Marie-Paule Pileni, resigned in protest (Hoffman 2009). Thermitic demolition should have created copious pools of melted steel at Ground Zero, but nothing remotely like this was ever found. Truthers say iron microspheres found in the rubble indicate thermite; since hot fires and spot-welding do produce very tiny spheres of iron, though, these “microspheres” are not unexpected. Pictures of cranes holding red-hot materials in the rubble are said to show molten steel. Had this been the case, however, the crane rigs would have immediately seized up (Blanchard 2006). No reports of “molten steel” in the tower basements have ever been credibly verified (Roberts 2008). Some Truthers claim that a few pieces of sulfidized “eutectic” steel found in the towers proves thermate (thermite with sulfur) usage, but this occurred because sulfur, released from burned drywall, corroded the steel as it stewed in the pile for weeks (Roberts 2008). What is often conveniently left out of the story are actual reports from NYFD firefighters at the scene, which describe huge, raging, unfought fires on many floors at once and visible deformations and creaking of the building prior to its collapse (Roberts 2008). Tower 7 was not hit by an airplane; however, it was struck by a 110-story flaming skyscraper, the North Tower. The fires raged for hours, and they eventually caused a critical column (#79) to fail because of thermal expansion; NIST determined that this column was crucial to the building and could even be considered a design flaw. Its failure would have collapsed the building even without the other structural damage from WTC 1’s collapse and the fires. WTC 7’s brief 2.25 seconds of free fall is now the Truthers’ best “smoking gun.” The claim usually goes like this: “The fifty-eight perimeter columns would have resisted and slowed the collapse to much less than freefall. The ‘freefall’ of WTC 7, admitted to by NIST, proves it was controlled demolition.” The problem is that this is a straw man argument. NIST found the collapse occurred in three stages. The first stage, which lasted 1.75 seconds, is when the fifty-eight perimeter columns were buckled; during this interval, the rooftop actually fell only about seven feet. This is because the breaking of columns saps speed, indeed making the collapse slower than free fall. In the second stage, which lasted 2.25 seconds, the already-buckled columns provided negligible support, and the north face of the structure free-fell about eight stories. (Try taking a plastic drinking straw and buckling it by folding it over and then pushing down on the bent straw with your hand. The crimped straw provides almost no resistance to vertical forces, and neither did the buckled columns of WTC 7.) The third stage described by NIST, which lasted 1.4 seconds, was again less-than-free fall, as the structure fell another 130 feet as it impacted more non-buckled structures toward the bottom of the building (NIST 2010). The other half of the equation is that WTC 7 resembles a “classic controlled demolition” because it supposedly “imploded, collapsing completely, and landed in its own footprint” (Gage 2011). In actuality, it twisted and tilted over to one side as it fell, and parts of the building severely damaged two neighboring buildings (the Verizon and Fiterman Hall structures). When challenged with the obvious fact that Tower 7 spilled far outside its footprint, however, Truthers will often change their tune and start saying that any resemblance to a natural collapse is part of the cover-up. Early on, it was mainly MIHOP (“Made it happen on purpose”) versus LIHOP (“Let it happen on purpose”). Nowadays most serious Truthers down-pedal the “no-planers,” who say no plane hit the Pentagon or even the Towers. There is considerable friction between some groups, with certain 9/11 Truth groups attacking others as “disinformation agents.” However, 9/11 Truth is mostly a big tent. Many “serious” groups such as AE911 Truth quietly champion “no-planers” such as former pilot Dwain Deets, engineer Anders Bjorkman, and Craig Ranke of Citizen Investigation Team (CIT) (Gage 2011). Gage formally withdrew his support of CIT in February 2011, even as his website touted 9/11 articles in Foreign Policy Journal, an online publication notorious for its frequent forays into Holocaust denial. As Ted Goertzel pointed out in his recent Skeptical Inquirer article “The Conspiracy Meme: Why Conspiracy Theories Appeal and Persist,” “When an alleged fact is debunked, the conspiracy meme often just replaces it with another fact” (Goertzel 2011). In another ten years, will the 9/11 Truth movement have developed new arguments, or will it stick with the polished claims discussed here? Either way, it appears this American conspiracy theory classic is here to stay. Avery, Dylan. 2009. Loose Change 9/11: An American Coup. Distributed by Microcinema International. Released September 22. Bazant, Dzenek, J. Le, F.R. Greening, and D.B. Benson. 2008. What did and did not cause collapse of World Trade Center Twin Towers in New York? Journal of Engineering Mechanics ASCE 13(10): 892–906. Available online at www.civil.northwestern.edu/people/bazant/PDFs/Papers/476%20WTC%20collapse.pdf. Blanchard, Brent 2006. A critical analysis of the collapse of WTC Towers 1, 2, and 7 from an explosives and conventional demolitions viewpoint. Journal of Debunking 911 Conspiracy Theories 1(2). Available online at www.jod911.com/WTC%20COLLAPSE%20STUDY%20BBlanchard%208-8-06.pdf. Chandler, David. 2010. Destruction of the World Trade Center North Tower and fundamental physics. Journal of 9/11 Studies 28 (February). Available online at www.journalof911studies.com/volume/2010/ChandlerDownwardAccelerationOfWTC1.pdf. Fana, Run-Hua, Hong-Liang Lü, Kang-Ning Sun, et al. 2006. Kinetics of thermite reaction in Al-Fe2O3 system. Thermochimica Acta 440(2) (January 15): 129–31. Gage, Richard. 2011. Architects and Engineers for 9/11 Truth. Available online at www.ae911truth.org. Goertzel, Ted. 2011. The conspiracy meme: Why conspiracy theories appeal and persist. Skeptical Inquirer 35(1) (January/February): 28–37. Harrit, Niels H., Jeffrey Farrer, Steven E. Jones, et al. 2009. Active thermitic material discovered in dust from the 9/11 World Trade Center catastrophe. Bentham Open Chemical Physics Journal 2: 7–31. Available online at www.bentham.org/open/tocpj/articles/V002/7TOCPJ.pdf. Mackey, Ryan. 2008. On debunking 9/11 debunking: Examining Dr. David Ray Griffin’s latest criticism of the NIST World Trade Center investigation. Journal of Debunking 911 Conspiracy Theories 1(4). Available online at www.jod911.com/drg_nist_review_2_1.pdf. NIST. 2010. Questions and answers about the NIST WTC 7 investigation (updated September 17). Available online at www.nist.gov/public_affairs/factsheet/wtc_qa_082108.cfm. Roberts, Mark. 2008. 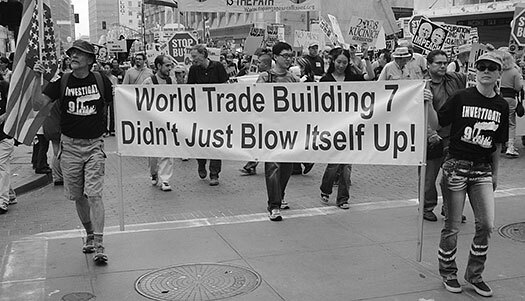 World Trade Center building 7 and the lies of the ‘9/11 Truth movement.’ Available online at http://sites.google.com/site/wtc7lies/introduction. Sublette, Carey. 2006. Complete list of all U.S. nuclear weapons. Nuclear Weapon Archive Organization. Available online at http://nuclearweaponarchive.org/Usa/Weapons/Allbombs.html. Sunder, Shyam, Richard G. Gann, William L. Grosshandler, et al. 2008. 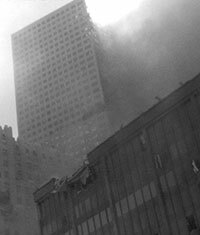 NIST Final Report on the Collapse of World Trade Center Building 7. Available online at http://wtc.nist.gov/NCSTAR1/PDF/NCSTAR%201A.pdf. “Sunstealer.” 2011. The sad case of Niels Harrit. JREF forum. Available online at http://forums.randi.org/showpost.php?p=6959549. Thomas, Dave. 2009. How I debated a 9/11 Truther and survived. Skeptical Briefs 19(4) (December). Available online at www.csicop.org/sb/show/how_i_debated_a_9_11_truther_and_survived/. ———. 2010a: The video Jesse Ventura doesn’t want the world to see! NM Skeptic Blog (March 24). Available online at http://nmskeptic.blogspot.com/2010/03/video-jesse-ventura-doesnt-want-world.html. ———. 2010b. Institute of Theoretical and Experimental 9/11 Physics 9-11 ‘Truth’ resources. New Mexicans for Science and Reason (August). Available online at www.nmsr.org/nmsr911.htm. ———. 2010c. 9/11 truth: The Coast-to-Coast AM debate. Skeptical Briefs 20(4) (December). Young, Jeffrey R. 2007. A Berkeley engineer searches for the truth about the Twin Towers’ collapse. Civil and Structural Engineers on WTC Collapse. Available online at http://911-engineers.blogspot.com/2007/06/berkeley-engineer-searches-for-truth.html. http://forums.randi.org, 9/11 Conspiracy Theory area. If you need every single 9/11 Truth claim sliced and diced a thousand ways, this is your site. The 9/11 advance-knowledge conspiracy theories center on arguments that certain institutions or individuals other than the perpetrators had foreknowledge of the September 11 attacks in the United States in 2001. Additional facets of the conspiracy theories include debate as to whether warnings received from foreign agencies were specific enough to have warranted preventative action, whether domestic intelligence about planned al-Qaeda attacks was thorough enough to have mandated intervention, the extent to which the alleged hijackers were under surveillance prior to the attacks, and whether Mossad or the PakistaniInter-Services Intelligence were aware of an imminent attack. Immediately following the attacks, President George W. Bush stated that: "Nobody in our government at least, and I don't think the prior government, could envisage flying air planes into buildings" and National Security AdvisorCondoleezza Rice claimed: "no-one could have predicted that they would try to use an airplane as a missile". An Air Force general called the attack: "something we had never seen before, something we had never even thought of." A few days after the attacks, FBI Director Robert Mueller announced: "There were no warning signs that I'm aware of that would indicate this type of operation in the country." However, Mueller noted that an FBI agent in Minneapolis said Moussaoui might be "that type of person that could fly something into the World Trade Center." Mueller said this warning should have been followed more vigorously. "The FBI had advance indications of plans to hijack U.S. airliners and use them as weapons, but neither acted on them nor distributed the intelligence to local police agencies. From the moment of the September 11 attacks, all high-ranking federal officials insisted that the terrorists’ method of operation surprised them. Many continue to stick to that story. Actually, elements of the suicide hijacking plan were known to the FBI as early as 1995 and, if coupled with current information, might have uncovered the plot." In 1994, there were three examples of failed attempts to deliberately crash planes ito buildings, including one where a lone pilot crashed a small plane into the lawn of the White House. The 2000 edition of the FAA’s annual report on Criminal Acts Against Aviation said that although Osama bin Laden ‘is not known to have attacked civil aviation, he has both the motivation and the wherewithal to do so,’ adding, ‘Bin Laden’s anti-Western and anti-American attitudes make him and his followers a significant threat to civil aviation, particularly to U.S. civil aviation.’"
"In the two years before the September 11 attacks, the North American Aerospace Defense Command conducted exercises simulating what the White House says was unimaginable at the time: hijacked airliners used as weapons to crash into targets and cause mass casualties. One of the imagined targets was the World Trade Center. In another exercise, jets performed a mock shootdown over the Atlantic Ocean of a jet supposedly laden with chemical poisons headed toward a target in the United States. In a third scenario, the target was the Pentagon — but that drill was not run after Defense officials said it was unrealistic." "We heard of the idea of planes as weapons, but I don't recall being presented with any specific threat information about an attack of this nature, or highlighting this threat, or indicating it was more likely than any other"
A single U.S.-based institutional investor with no conceivable ties to al-Qaeda purchased 95% of the UAL puts on September 6 as part of a trading strategy that also included buying 115,000 shares of American on September 10... much of the seemingly suspicious trading in American on September 10 was traced to a specific U.S.-based options trading newsletter, faxed to its subscribers on Sunday, September 9, that recommended these trades. In 2002, FBI agent Coleen Rowley wrote to FBI director Robert Mueller describing her experience working with Minneapolis FBI agents tracking suspected terrorist Zacarias Moussaoui prior to the attacks. She describes how FBI HQ personnel in Washington, D.C. had mishandled and failed to take action on information provided by the Minneapolis Field Office, and had failed to issue a warrant to search Moussaui's computer despite having probable cause. [unreliable source?] Senator Chuck Grassley later wrote that “If the application for the FISA warrant had gone forward, agents would have found information in Moussaoui's belongings that linked him ... to a major financier of the hijacking plot". Rowley was credited as a whistleblower and jointly awarded the TIME Magazine "Person of the Year" for 2002. Her testimony to the 9/11 Commission was omitted from their final report. Shortly after the attacks, David Schippers, the chief prosecutor for the impeachment of Bill Clinton, stated that the government had been warned in 1995 about a future attack on a government building and that later he was contacted by three FBI agents who mentioned uncovering a possible terrorist attack planned for lower Manhattan. According to Schippers, as the agents informed their superiors, they were briefed not to pursue the issue and were threatened with prosecution. Schippers declared, "Five weeks before the September 11 tragedy, I did my best to get a hold of Attorney GeneralJohn Ashcroft with my concerns." According to Schippers, Ashcroft responded that the Justice Department does not start investigations at the top. Author William Norman Grigg agrees with Schippers in his article "Did We Know What Was Coming?" According to the article, three unnamed veteran federal law enforcement agents confirmed "the information provided to Schippers was widely known within the Bureau before September 11." On December 22, 2010, a United States Federal Judge signed a default judgment holding Iran, the Taliban and al-Qaeda liable following an open court hearing in which the evidence was produced by the plaintiffs' attorneys which they said showed that Iran assisted the hijackers. 9/11 commission members and witnesses who claimed they were Iranian defectors and members of Ministry of Intelligence and National Security and the Iranian Revolutionary Guards also testified during the hearing. The suit Havlish, et al. v. bin Laden, et al was brought in 2001 by Fiona Havlish whose husband died in the North Tower. Abolghasem Mesbahi, who claimed he was a former Ministry of Intelligence operative in charge of Iran’s espionage operations in Western Europe testified that he was part of a task force that designed contingency plans for unconventional warfare against the United States code-named Shaitan dar Atash/Satan in Flames which included crashing hijacked passenger airliners into the World Trade Center, the Pentagon, and the White House, and that in the summer of 2001 he received three coded messages telling him to activate the plan. An Iranian government memorandum was presented as evidence that Iran's Supreme Leader Ayatollah Khamenei had pre knowledge of the attacks. Several days after the ruling a spokesperson for Iran's Foreign ministry said charges that Iran “had a hand in planning the attacks and that one of al-Qaeda’s members was present inside the country is baseless” and said "With the repetition of such claims to back its political aims the U.S. is putting the peace and security of the world in jeopardy,”. The five men worked at the company Urban Moving Systems, owned and operated by Dominik Suter. After the men were arrested the FBI searched their offices and questioned Suter, however Suter fled to Israel before he could be questioned further. Eventually, Suter's name appeared on the May 2002 FBI Suspect List, along with the Sep 11 hijackers and other suspected extremists. Iranian PresidentMahmoud Ahmadinejad said in an August 2010 speech that no "Zionists" were killed in the attacks since, according to him, "one day earlier they were told not go to their workplace." He also remarked, "What was the story of September 11? During five to six days, and with the aid of the media, they created and prepared public opinion so that everyone considered an attack on Afghanistan and Iraq". However, contrary to such conspiracy theories about Jews being warned not to go to work that day, the number of Jews who died in the attacks is variously estimated at between 270 and 400, while a few Israelis died in the attack as well. Moderate elements of the Taliban are reported to have given the USA advance warning of the attacks. The BBC reports that Wakil Ahmed Muttawakil, the Taliban's Foreign Minister, sent the USA an advance warning of the attack following a tip-off he received from Tohir Yo‘ldosh, the leader of the Islamic Movement of Uzbekistan. Like al-Qaeda, the Taliban allowed the Islamic Movement of Uzbekistan to place training camps in Afghanistan. Tohir Yo‘ldosh was reported to have been concerned that if al-Qaeda was not stopped prior to launching the attacks, the USA would retaliate against all of Afghanistan, which would have a negative effect on his movement's efforts. ^ abComplete 911 Timeline: Key WarningsArchived March 6, 2008, at the Wayback Machine..
^Did Bush Know? :: Warning Signs of 9–11 and Intelligence Failures :: (by Nafeez Mosaddeq Ahmed) – Media Monitors Network. ^ abNORAD had drills of jets as weapons By Steven Komarow and Tom Squitieri, USA TODAY. Retrieved 2010-01-13. ^ Charles Aldinger, "Pentagon crash scenario rejected before Sept. 2001", Reuters, April 14, 2004. Archived October 23, 2009. ^part 2, pp. 209, 212. ^Stocks Inquiry: Millions of shares sold before disaster by James Doran, The Times, September 18, 2001. ^ Tom Bogdanowicz and Brooks Jackson (September 24, 2001). "Probes into 'suspicious' trading". CNN. Retrieved 2011-07-07. ^SEC wants data-sharing system: Network of brokerages would help trace trades by terrorists October 19, 2001. Retrieved March 24, 2009. ^Bin Laden rigged oil and gold prices – bank chief September 23, 2001. Retrieved March 24, 2009. ^Unusual Option Market Activity and the Terrorist Attacks of September 11, 2001Archived May 28, 2008, at the Wayback Machine. by Allen M. Poteshman. Retrieved 2010-01-12. ^Statement of Mindy Kleinberg to the National Commission on Terrorist Attacks Upon the United States March 31, 2003. ^page 51 of the Commission Report, PDF. ^ "Computer disk drives from WTC could yield clues". CNN. December 20, 2001. ^ "Das Geheimnis der verkohlten Festplatten". Der Spiegel. December 18, 2001. ^ National Commission on Terrorist Attacks Upon the United States (October 18, 2003). "FBI Bfiefing on Trading"(PDF). ^ Marc Chesney; et al. (January 2010). "Detecting Informed Trading Activities in the Options Markets". Social Sciences Research Network. SSRN 1522157 . ^ Wing-Keung Wong; et al. (April 2010). "Was there Abnormal Trading in the S&P 500 Index Options Prior to the September 11 Attacks?". Social Sciences Research Network. SSRN 1588523 . ^9/11 Commission Report Executive Summary, p. 2. ^9/11 Commission Report Executive Summary, p. 6. ^ Cameron, Carl (May 17, 2002). "Clues Alerted White House to Potential Attacks". Fox News. ^United States Congress. " "U.S. Intelligence." " Congressional Record—House. Washington, D.C.: GPO, June 27, 2005. 109th Cong., 1st sess. HR H5244. ^United States Congress. " "U.S. Intelligence." " Congressional Record—House. Washington, D.C.: GPO, June 27, 2005. 109th Cong., 1st sess. HR H5250. Retrieved August 3, 2006. ^More pre-9/11 US intelligence connections to al-Qaeda exposed and spun Online Journal.Com August 24, 2005 pdf. ^Claim about 9/11 takes new twistSan Francisco Chronicle August 19, 2005. ^WELDON RESPONDS TO OMISSION OF ABLE DANGER FROM 9/11 REPORT, August 12, 2005. Retrieved 2010-01-12. ^JFK and 9/11 – Insights Gained from Studying Both by Dr. Peter Dale Scott, December 20, 2006. Retrieved 2010-01-12. ^What Went Wrong by Seymour M. Hersh, The New Yorker, October 8, 2001. Retrieved 2010-01-12. ^April 2, 2004 'I saw papers that show US knew al-Qa'ida would attack cities with aeroplanes' The Independent. ^FBI & 9/11 – by Sibel Edmonds.